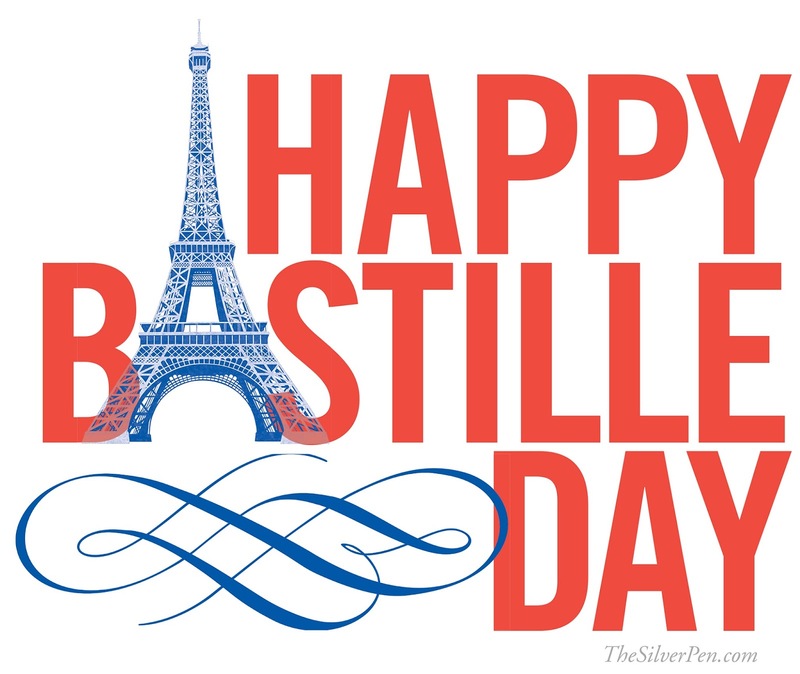 Commemorate Bastille Day at La Bazenne on Fifth! 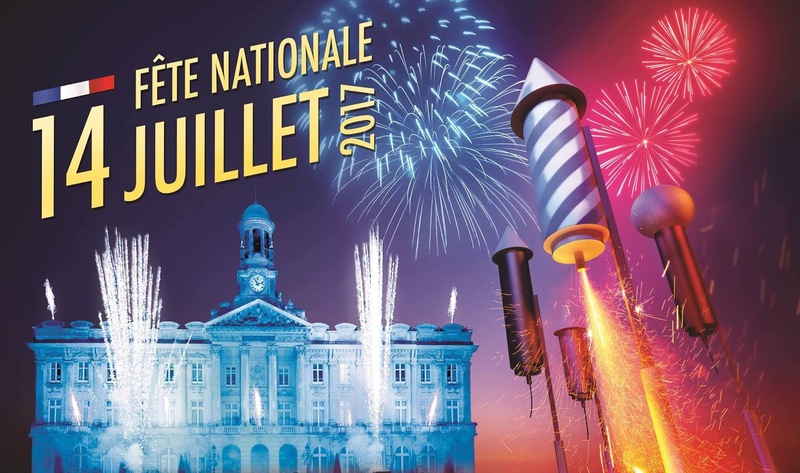 Bastille Day "Soiree en Blanc"
La Bazenne cordially invites you to the Annual Bastille Day "Soirée en Blanc" Party on Friday July 14th starting at 5pm! Dress in white; challenge yourself and your friends to win La Bazenne's French Trivia Quiz as well as other Patio Games, and celebrate the French "joie de vie" with classic and modern French musical and culinary delights. If you have any Special Requests for a Favorite French Dish, Let us Know in Advance and We will do our Best to Accommodate. This is an event you don't want to miss, so RSVP as soon as possible online or by calling 239.682.8623! The first 30 Attendees to RSVP on Facebook and Like us on Facebook and Dress in White = Complimentary La Bazenne Royal Champagne Cocktail! 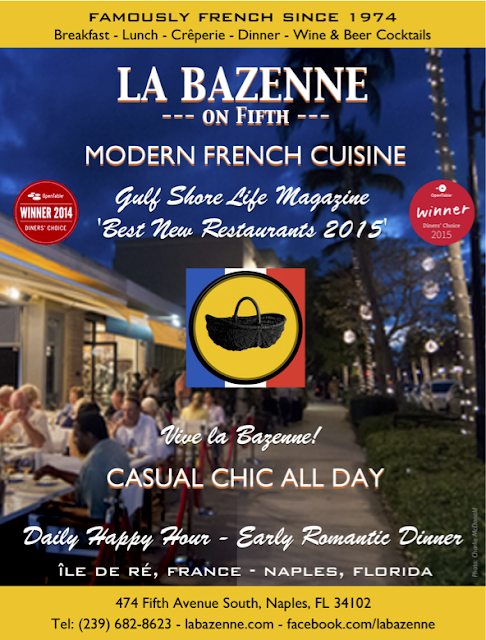 Celebrate 4th of July at La Bazenne on Fifth! 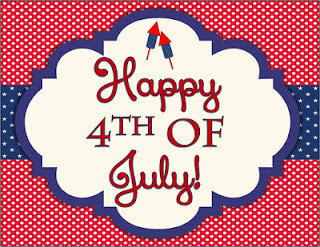 In honor of Independence Day, La Bazenne on Fifth will be exceptionally OPEN FOR BRUNCH to allow our guests to enjoy the annual 4th of July parade on Fifth Avenue South! Come for the Parade and stay for the Fireworks! Enjoy the tastiest bites on 5th, premium Illy coffee, decadent champagne cocktails and the best views of the day’s events! Treat Dad to Father's Day at La Bazenne! (Happy Sunday Brunch = 2-for-1 Mimosas and Bazenne Royals). with any purchase this Saturday and Sunday ONLY! prepared sous-vide style, in the comfort of their homes. or order in advance to cater your parties of 6 or more. Still looking for a great last minute Father's Day present? Purchase a Gift Card for Your Dad! 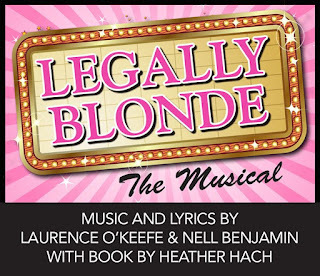 from Friday, May 12th - Sunday, May 14th! to pay tribute to all of the women in our lives. through Brunch, Lunch, Happy Hour and Dinner. as well as the option to enjoy at Prix-Fixe Menu. We look forward to welcoming you to a French-inspired Easter Celebration! Brunch kicks off at 9:30am and the fun continues straight through to Dinner on Sunday, April 16th. Our full à la carte Brunch and Dinner Menus will be on offer as well as a variety of fabulous Easter-themed specials. As always, "Happy Sunday" = 2 for 1 Mimosas Bazenne Royals All Day! 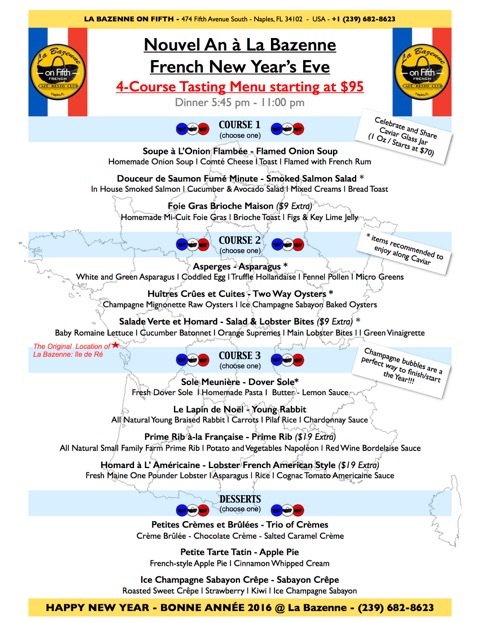 Join us for an Authentic Taste of France at the Original French Restaurant on 5th Avenue South! Enjoy a Romantic 3 Course Tasting Menu or a Select à la Carte Menu from 4pm Onwards. The grapes are harvested manually and vinified completely without SO2. The wines are not chaptalized, filtered, or degassed and only natural yeasts are used for the fermentation. all Beaujolais Nouveau purchases at $11 a glass. La Bazenne's al fresco patio is the Best Place on 5th to experience the festivities of the Halloween Spooktacular on 5th on Monday, October 31st. Treat yourself to Naples' favorite Modern French Cuisine while enjoying Live Music, Kid’s activities, Trick or Treating, Spooky Movies and Cartoons, Haunted Houses, Live Animals, a Street Dance, and so much more. Seating is extremely limited for this event, so book early to ensure your seat! 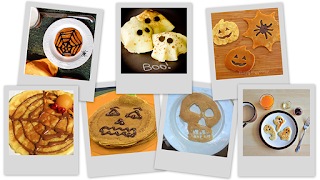 La Bazenne invites "Kids" of all Ages (adults included) to participate in our pre-Halloween Crêpe Making Contest on Saturday, October 29th from 12pm - 4:30pm. Bring your friends and family to our Crêpe-Decorating Station Before or After Lunch and La Bazenne will provide you with a wide range of ingredients that you can use to design a crêpe according to your tastes! You are also invited to bring one secret ingredient of your own liking should you be so inclined. Prizes will be awarded to the best Halloween-inspired designs. The cost of participation is $10, tax and gratuity included. Be the First to Taste La Bazenne's New Fall Menu Items with Sample Wine Pairings at a Fun-Filled French Cocktail Party, animated by Owners Amy & Romuald Giacometti and Chef Johnny Mesta. The cost of the event is $33 for Social Club members and $38 for Non Social Club Members, tax and gratuity included. Reservations are required and can be made by booking online at www.labazenne.com or by calling 239.692.8623. 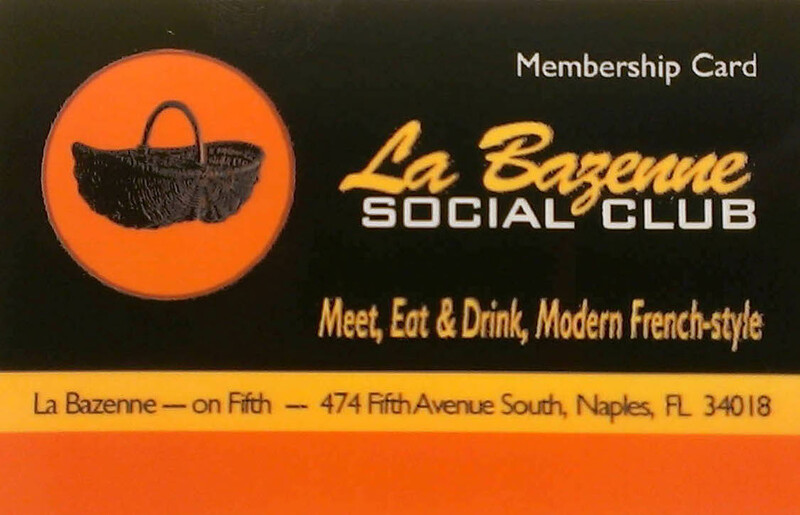 La Bazenne Social Club Members will be treated to a complimentary Select Drink! The evening will begin at 6:00 p.m with Dinner at La Bazenne on Fifth, where you are welcome to enjoy the Best of Modern French Cuisine in Naples. 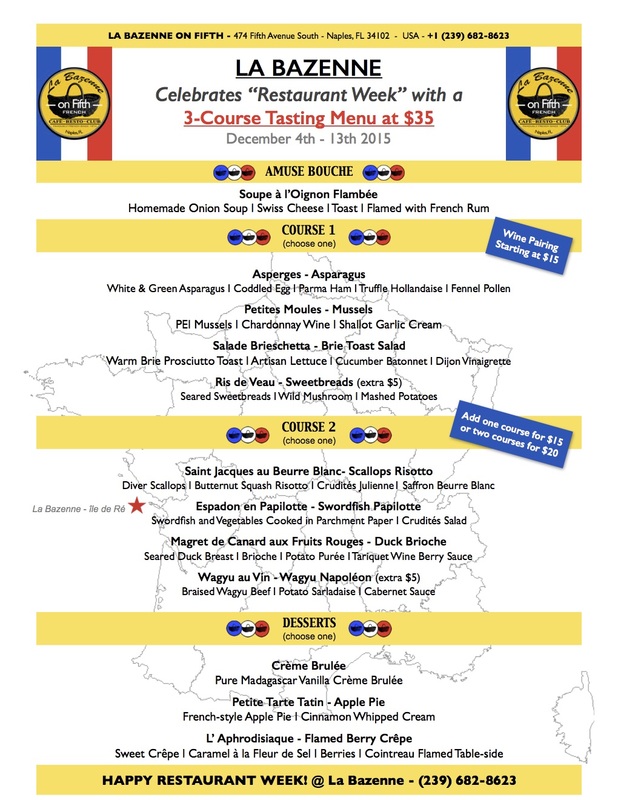 (2 Entrées + a Bottle of Wine for $44 / couple) will be available. 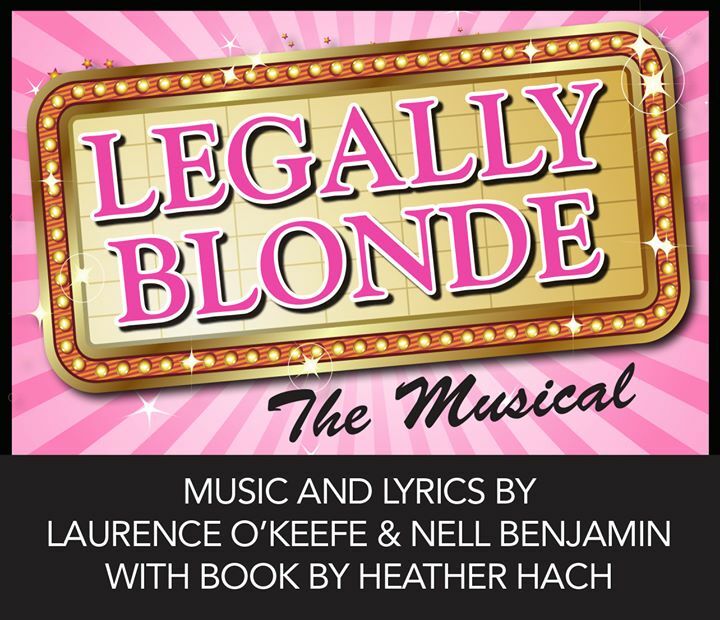 Mayor John Sorey, who is the Executive Director of the Naples Players, will also be in attendance to speak about the Naples Players and the Show. 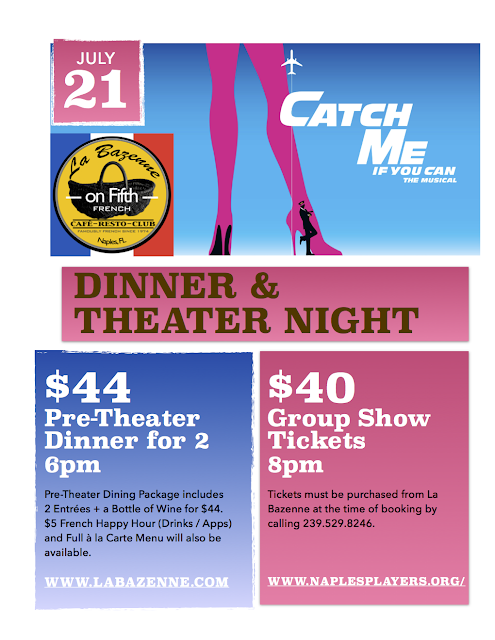 After dinner, Guests will attend the 8:00pm performance of "Catch Me if You Can"
- a short walk from La Bazenne. no later than July 19th. and this must be paid at the time of booking. No pre-payment for Dinner is required. The evening promises to be a fun-filled night out, so bring friends and family! Thursday July 14th starting at 5pm! Dress in White = Complimentary La Bazenne Royal Champagne Cocktail! Let us Know in Advance and We will do our Best to Accommodate. online or by calling 239.682.8623! Venez parler français or anglais! Come join us Monday May 9th at Noon! We are kicking off our Summer Lunch Bunch at the wonderful French Bistro, La Bazenne! Its always a warm greeting by Theta proprietor Amy Giacometti and her delightful husband Romuald and the menu is such a treat! Come share some time with Thetas at a great venue! On Sunday, May 18th, La Bazenne on Fifth will be hosting a special Mothers' Day Brunch and Dinner to pay tribute to all of the women in our lives. La Bazenne will be open from 9:30am - Onwards through Lunch, Happy Hour and Dinner. Reserve today on Open Table at www.labazenne.com or by calling 239.682.8623. Socia Club Mom's will receive a Special Gift for the Evening! La Bazenne will be offering a Special 3-Course Chef's Tasting Menu All Week from Friday, May 6th - Sunday, May 15th for $35 / person (tax and gratuity excluded). Wine pairings will also be available upon request. Book your table on www.labazenne.com or by calling 239.682.8623. Social Club Members will receive a Complimentary Welcome Drink with each Restaurant Week Menu purchase. Book your table for Lunch or Dinner on Thursday, May 5th for a Cinco de Mayo French-Mex Culinary Extravaganza. Specials of the Day will include our Fresh Fish, All Natural Meats, and Vegetarian Dishes with a Mexican twist. Tickle your taste buds with spicy herbs, Maseca-based crêpes, Tequila-infused sauces and the best Guacamole in Southwest Florida! Also, enjoy La Bazenne's Signature French Sparkling Margaritas for $5 or Bottles of French 1664 Beer and Mexican Dos Equis Beer for $3 all Day. For Social Club Members, your First Margarita or Beer is on Us!! On Monday, May 2nd, Enjoy La Bazenne's Romantic Dining Special of Two Entrées and a Bottle of Wine for $44 All Night Long. All Social Club Members are invited to Enjoy a Complimentary Cocktail with their Meals! 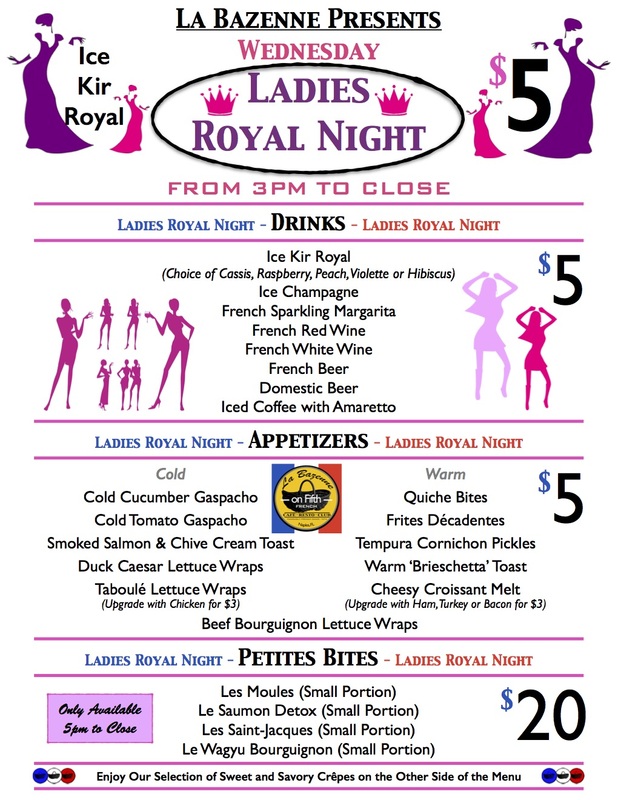 Grab your Favorite Girlfriends and head over to La Bazenne for “Ladies Royal Night” on Monday, April 18th from 5pm Onwards. The menu for the event features $5 Ice Champagne Cocktails, Wine, Beer, Happy Hour Appetizers all night as well as Smaller Dinner Entrées for Ladies”. For Social Club Members, your First Featured Drink Special is on Us!! RCC Members will be treated to a complimentary glass of Ice Champagne as well as a 10% discount on all food items at La Bazenne that night (excluding Happy Hour and Early Romantic Dining offers). Book your table for Lunch or Dinner on Monday, April 11th for a French-Mex Culinary Extravaganza. Also, enjoy La Bazenne's Signature French Sparkling Margaritas for $5 or Bottles of Dos Equis for $3 all Day. On Monday, April 4th, Enjoy La Bazenne's Romantic Dining Special of Two Entrées and a Bottle of Wine for $44 All Night Long. This Month's Social Club Monday will feature a Special Afternoon Cocktail on March 28th from 4pm - 6pm with a Wine Tasting Event featuring our Top Reserve Wines. Owner Romuald Giacometti will present each wine and explain what makes them special and which menu items pair best with each. The event will cost $30 / person and includes complimentary appetizers. 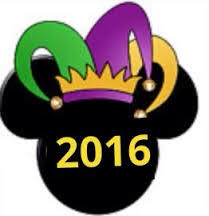 Reservations can be made by calling 239.682.8623 and booking by credit card prior to March 23rd. We very much look forward to welcoming your family and friends to a French-inspired Easter Weekend Celebration. Brunch Service kicks off at 9:30am and the Fun Continues through Happy Hour and on to Dinner on both Saturday and Sunday. Our full à la carte Brunch, Happy Hour and Dinner Menus will be on offer as well as a variety of exquisite specials. As always, "Happy Sunday" = 2 for 1 Mimosas & Bazenne Royals All Day! 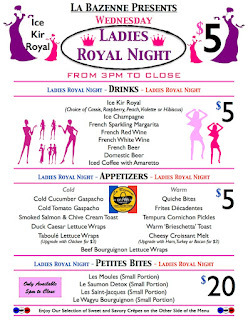 Grab your Favorite Girlfriends and head over to La Bazenne for “Ladies Royal Night” on Monday, March 21st from 5pm Onwards. The menu for the event features $5 Ice Champagne Cocktails, Wine, Beer, Happy Hour Appetizers all night as well as Smaller Dinner Entrées for Ladies”. 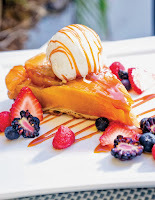 Come to Enjoy Brunch, Lunch or Dinner on both Saturday and Sunday during the 28th Downtown Naples Festival of the Arts, which takes place on Saturday, March 19th and Sunday, March 20th. The festival allows thousands of art-savvy festival goers to mill about the 230+ booths that participating artists set up under the canopy of oak boughs and golden trumpet trees that shade flower-lined Fifth Avenue South from southwest Florida’s brilliant springtime sunshine from Highway 41 west to 3rd Street South just blocks from the gulf. La Bazenne will be open from 9:30am - Onwards so that you can enjoy the best seats in the house for the Annual St. Patrick's Day Parade. Wear your green and enjoy the revelry of the 39th annual Naples St. Patrick's Day Parade, followed by an all-day celebration at Sugden Plaza. The Parade draws over 40,000 people to downtown Naples each year to celebrate Irish heritage and Irish culture in America and "La Terrase" at La Bazenne on Fifth is the best spot to participate in the festivities. Green Beer will Abound. La Bazenne invites all Social Club Members to Enjoy a Complimentary Glass of Green Beer! Right after the blissful romance of Valentine's Day, Grab your Favorite Girlfriends and head over to La Bazenne for “Ladies Royal Night” on February 15th from 5pm Onwards. The menu for the event features $5 Ice Champagne Cocktails, Wine, Beer, Happy Hour Appetizers all night as well as Smaller Dinner Entrées for Ladies”. Start out with Brunch from 9:30am - 3pm with 2-for-1 Mimosas or Bazenne Royals or Enjoy a Classy French Romantic Dinner by Night. 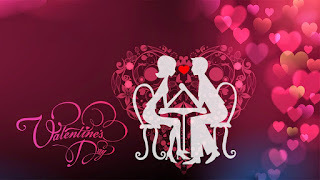 La Bazenne will be offering an à la Carte Menu and Romantic Specials (Details to be posted on our website soon). 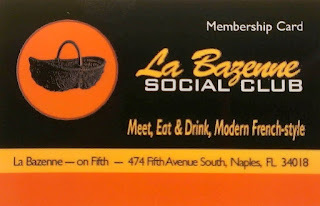 The Young Professionals of Naples will Enjoying Brunch at 11:30am at La Bazenne, so if you are in the Group or interested in joining, contact Richard Michel on networking@ypnaples.com. This Brunch will be à la carte. 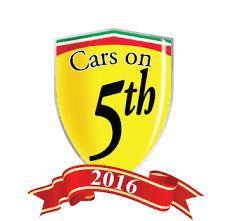 Wine and Dine at La Bazenne from 9:30am Onwards while enjoying the Ferrari Club of Naples’ annual Cars on 5th show! More than 100 Ferraris will be on display with a fine mix of vintage and current V-8s and V-12s from Maranello that are guaranteed to please the crowds. The British contingent will include Jaguar, Lotus, Triumph and the stately Bentleys. Porsches will be plentiful, including some rare race cars. American cars will not be overshadowed, with over 60 Corvettes and other muscle cars expected. 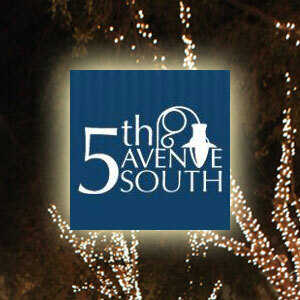 Enjoy live Music, shopping, dining, dancing on fabulous 5th Avenue South! Evening on 5th will feature an array of live musical performances throughout the sidewalk areas of 5th Avenue South. The night will also include fabulous dining, and the opportunity to explore the distinct boutiques, shops, and galleries that span from 9th Street to 3rd Street. Whether you want to relax with friends at dinner or dessert, or dance with your favorite entertainers, you won’t want to miss this event. La Bazenne will be offering a Complimentary Mardi Gras-inspired Cocktail for all Current Social Club Members who Dine with us that Night! Book your table for Lunch or Dinner on February 8th for a French-Mex Culinary Extravaganza. Specials of the Day will include our Fresh and All Natural Proteins and Vegetables with a Mexican twist. Tickle your taste buds with spicy herbs, Maseca-based crêpes, Tequila-infused sauces and the best Guacamole in Southwest Florida! If you're not planning on splurging $10.000 for this Year's Festival, Make La Bazenne your destination for the Best Wine and Food Pairing Experience in Naples. Social Club Members enjoy our Exclusive Reserve Wines with Dinner for a 10% Discount all Weekend Long. La Bazenne Team who will be paying tribute to French Food and Culture by designing the Top Chalk Art on 5th! La Bazenne will be Open for Brunch, Lunch, Happy Hour and Dinner from 9:30am Onwards. Our New Winter Menus are Making their Debut TODAY, Thursday, January 21st, starting at 5pm! Be the First to Try La Bazenne's Sensational New Seasonal Favorites! Also, Social Club Members are Welcome to Enjoy a Complimentary Glass of Homemade Vin Chaud ("Mulled Wine") Before or After Dining with us that Night. 2) a Special Pre-Fixe Tasting Menu from 6pm - Onwards starting at $95. (see details below - no happy hour or early romantic dinner that night). Wine Pairings Available upon Request. by calling 239.682.8623 or online at www.labazenne.com. A credit card guarantee will be taken at the time of reservation. We will be New Year's Day to Allow our Team Members to Spend Time with Their Families. However, we will be back to offer Holiday Brunch Saturday 2nd and Sunday 3rd from 9:30 pm to 3pm. with Wine Pairings Available upon Request. We will be Closed on Christmas Day to Allow our Team Members to Spend Time with Their Families. 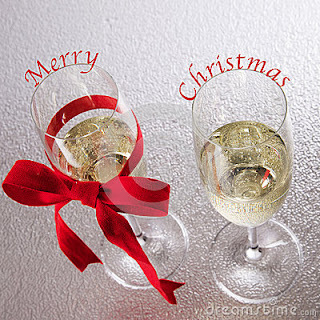 However, we will be back to offer Holiday Brunch Saturday 26th and Sunday 27th from 9:30 pm to 3pm. Book Your Table at La Bazenne Before or After Enjoying the Lively Musical Performances at the Sugden Center on 5th Avenue South from 6:30pm - 7:30pm. 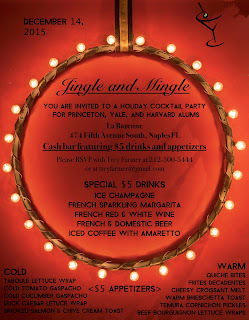 La Bazenne Welcomes Alumni from Princeton, Yale and Harvard to celebrate the season with a Special Happy Hour from 5:30pm - 7:30pm. There will be a Cash Bar with Special $5 French Cocktails and $5 French Appetizers as well as any other Menu Items at List Price. Contact Trey Farmer ’93, treyfarmer@gmail.com or 212-300-544 (cell) to reserve a spot. Book Your Table at La Bazenne Before or After Enjoying the Lively Musical Performances and Sidewalk Sales on 5th Avenue South from 6:30pm - 9:30pm. La Bazenne Welcomes Yale Alumni to a French Champagne Tasting, Lecture and Lunch. At the start of the lunch, Owners Amy & Romuald (Romeo) Giacometti, along with Trey Farmer, will guide guests through a tasting of 5 different Kir Royals (Champagne and French Fruit-based Liquors). After the tasting, all will enjoy a Special Lunch Menu, ending with a sampling of a Variety of Sweet Crêpes. 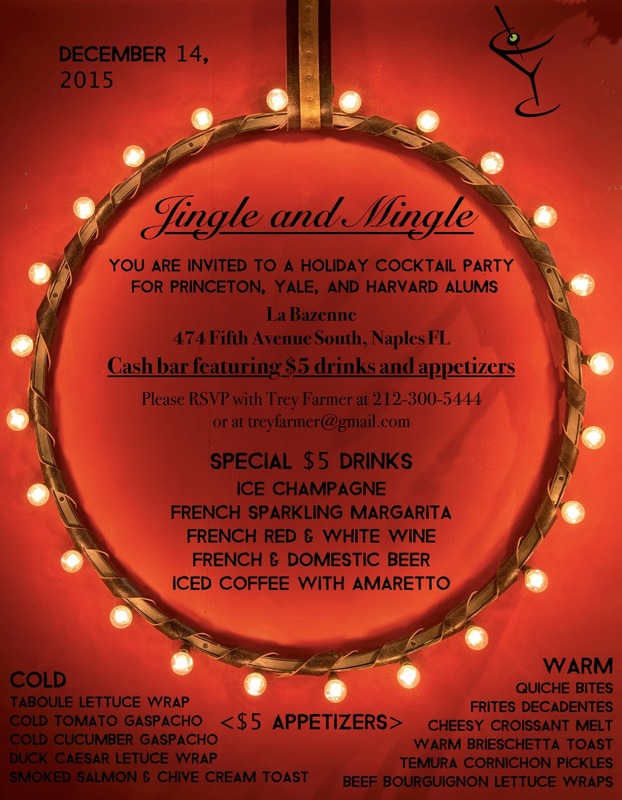 RSVP to Trey Farmer at treyfarmer@gmail.com. La Bazenne on Fifth welcomes the League Club of Naples to an elegant French Luncheon, followed by a Crêpe-Making Demonstration and Design Contest. For the Crêpe Design Contest, La Bazenne will provide you with a wide range of ingredients they use in-house so that you can design a crêpe according to your tastes! You are also invited to bring one secret ingredient of your own liking should you be so inclined. The Winner of the Contest will be asked to name their Crêpe, which will be featured as a special all week at La Bazenne. The Winner will also be welcome to enjoy their Crêpe any time they like for a full week at La Bazenne on Fifth. The cost of the event is $38, tax and gratuity included. A glass of wine will be included with the Luncheon, but you are also welcome to enjoy any additional drinks from the Bar at List Price. “La Terrasse” at La Bazenne is the best spot to Watch the Naples Christmas Parade! We Invite Current Social Club Members to come Take Their Pictures Next to our Christmas Tree During the Parade while Enjoying a Complimentary Bazenne Royal! La Bazenne will be offering a Special 3-Course Chef's Tasting Menu All Weekfor $35 / person (tax and gratuity excluded). Wine pairings will also be available upon request. Join us This Thursday, December 3rd Before or After the 41st Annual Christmas Walk and Christmas Tree Lighting on 5th Ave South from 5-9pm. La Bazenne will also be Lighting Our Christmas Tree that Night and Invites Current Social Club Members to come Take Their Pictures with the Tree while Enjoying a Complimentary Bazenne Royal! Treat You and Your Loved Ones to a French-American Themed Thanksgiving Prix Fixe Dinner! Seatings Available from 4:30pm - 5:00 pm and 7:30pm - 8:00pm. 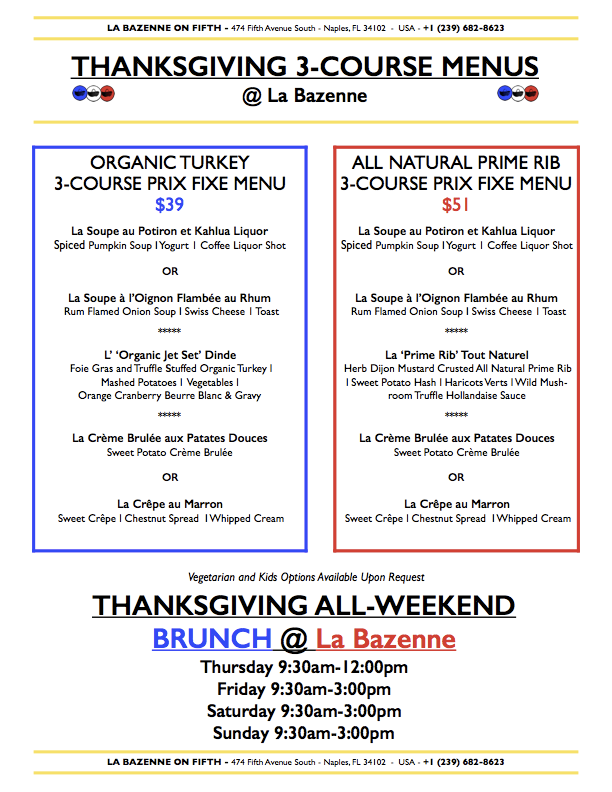 La Bazenne will also be serving Brunch All Weekend Long! 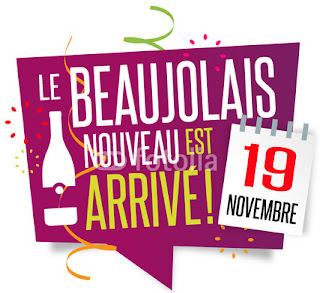 This French Thursday, November 19th, La Bazenne invites you to Try the Beaujolais Nouveau 2015! Joseph Drouin's 2015 Beaujolais Nouveau will be offered at $9 / glass or $35 / bottle. 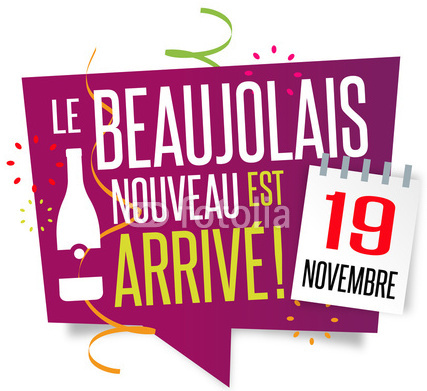 Current Social Club Members are Invited to Enjoy all Beaujolais Nouveau purchases at 20% Off. 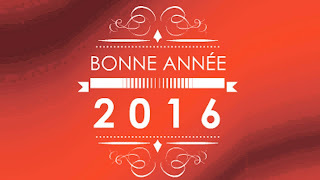 2015 will undoubtedly be remembered as one of the greatest years ever in the Beaujolais. Right up until the harvest, things could hardly have been better, and the harvest itself was carried out in excellent conditions. The general feeling: the yields have been very small throughout the Beaujolais area, with beautiful thick-skinned berries, which were fairly light in weight, but dark in colour. The lack of rainfall was reflected in the reduced quantity of juice. This year the skins very quickly yielded their juice, which is a pretty garnet colour with blue tints. The bouquet has good intensity and clearly presents notes of black fruits, blackberries and liquorice with a little spice. Areas of higher altitude, which produced grapes with more acidity and freshness, were favoured in our grape purchases. We had to be very careful during the vinifications not to extract too much tannin in order to preserve the fresh, fruity, supple and approachable character. We remark with interest the way that the hierarchy of the appellations has been respected with the Beaujolais being slightly less coloured and lighter, and the Beaujolais villages being more full-bodied and intense. Join us for a Fun-Filled "Something's Afoot" Dinner and Theater Night! Enjoy the Best of Modern French Cuisine in Naples. We will be offering both an à la carte Menu as well as an Expanded Early Romantic Dinner Special Menu (2 Entrées + a Bottle of Wine for $38 / couple). Sudden Center, 701 5th Avenue South, Naples, FL 34102 - a short walk from La Bazenne. and this must be paid at the time of booking. No pre-payment for Dinner is required. La Bazenne on Fifth cordially invites you to join us for our La Bazenne Social Club's Fall Launch Party and Happy Hour on Thursday, October 15th from 4pm - 6pm! 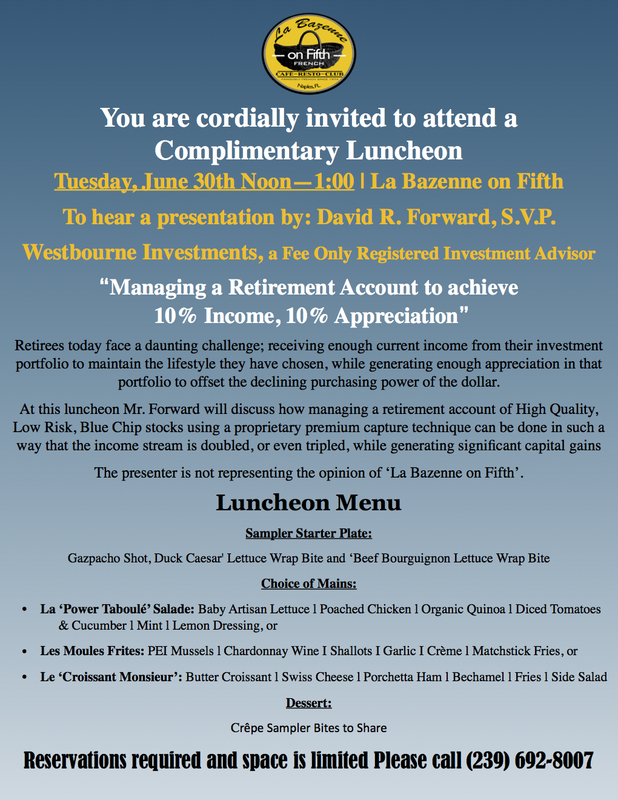 RSVP Today on www.labazenne.com or by calling 239.682.8623. All weekend from Thursday to Sunday, October 8th - 12th, we are hosting a “Seafood Weekend”! we will be offering an all New Selection of Fish Dishes that are in Contention for a Place on our Expanded Fall Menu. 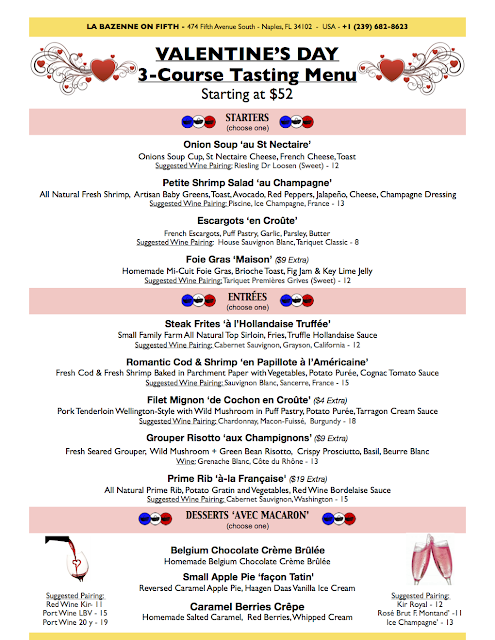 Arrive Early and Enjoy and our Early Romantic Dining Special with 2 Entrées and a Bottle of Wine for $38. (Kindly note upgrade charges may apply for some Fish Specials). with a Young Local Women’s Group called “The Coconut Society”! They are a new group in town and looking forward to expanding their footprint here. 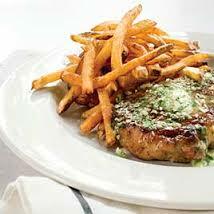 Happy Hour Appetizers all night as well as $20 Smaller Dinner Entrées for Ladies”. 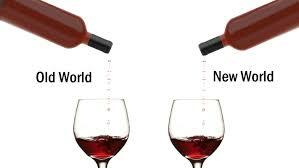 "Old World vs. New World Taste-off" on Thursday, September 24th from 4pm - 6pm. Armand Alikaj of Vinecraft, along with Owners Amy & Romuald Giacometti will present a selection of 6 Tasting Glasses of Wine. Participants will Taste and Compare Similar Wine Varietals from the Old World and New World and Understand how Each Wine Varietal is Affected by its "Terroir". Tastings will be accompanied by Hors d'Œuvres that Pair with Each Wine. 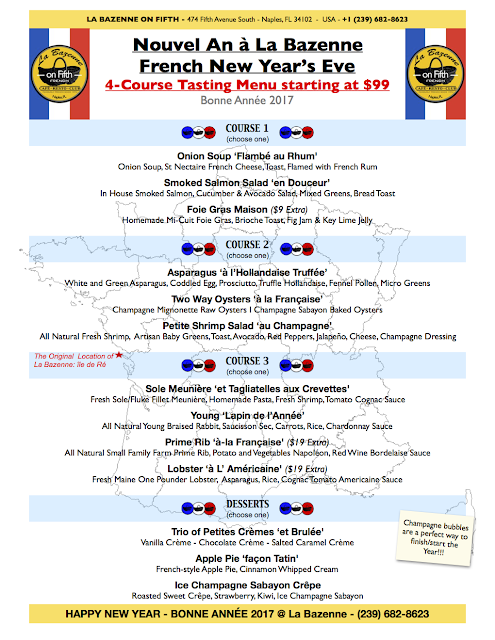 The cost of the event is $30 / person and includes 6 tasting glasses and accompanying light hors d'œuvres. RSVP online at www.labazenne.com or by calling 239.682.8623. Please indicate "Wine Workshop" when making your booking. 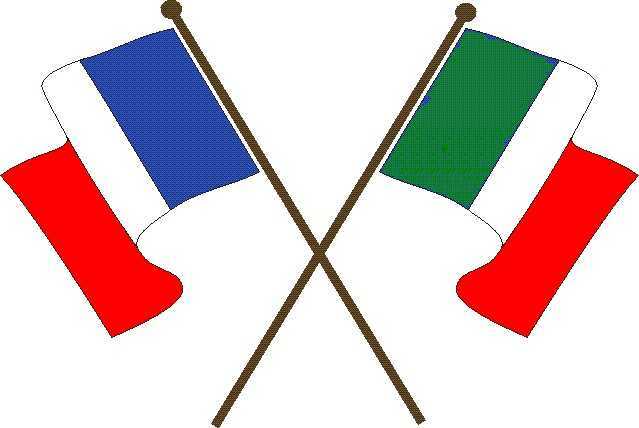 'A Journey from France to Italy' on Thursday, September 17th from 4pm - 6pm. Each Wine Tasting will be accompanied by a Light French-Italian Hors d'Œuvres that Pairs with Each Wine. 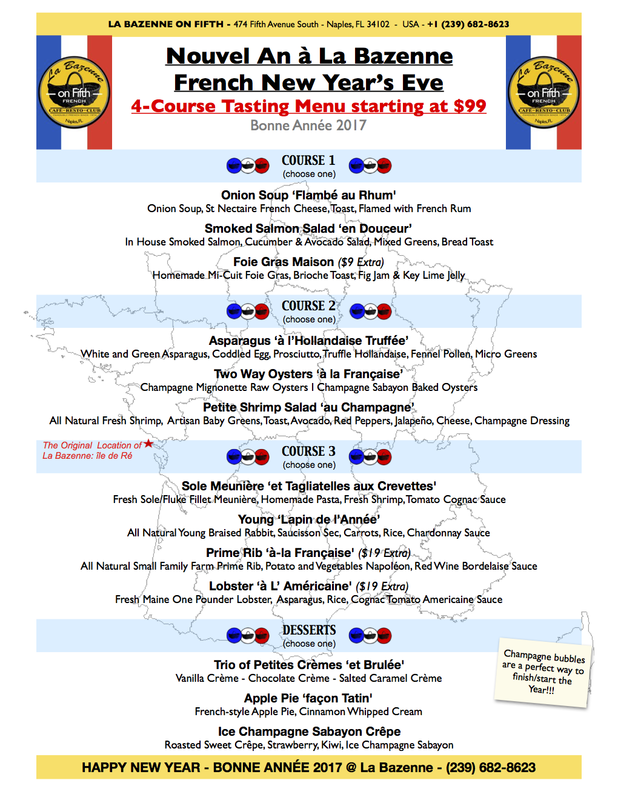 The cost of the event is $30 / person and includes 6 tasting glasses and accompanying light hors d'œuvres. RSVP online at www.labazenne.com or by calling 239.682.8623. Please indicate "Wine Workshop" when making your booking. "Taste and Vote on our New Wines" on Thursday, September 10th from 4pm - 6pm. Pierre Grilo of PG Fine Wines and Canelle will Present a Selection of 6 Wines from Different Regions of France and Participants will VOTE on any New Wines for La Bazenne's Menu. 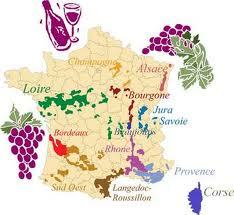 The Wine Tasting will be accompanied by Light Hors d'oeuvres inspired by the regions of France. The cost of the event is $30 / person and includes 6 tasting glasses and accompanying light hors d'oeuvres. 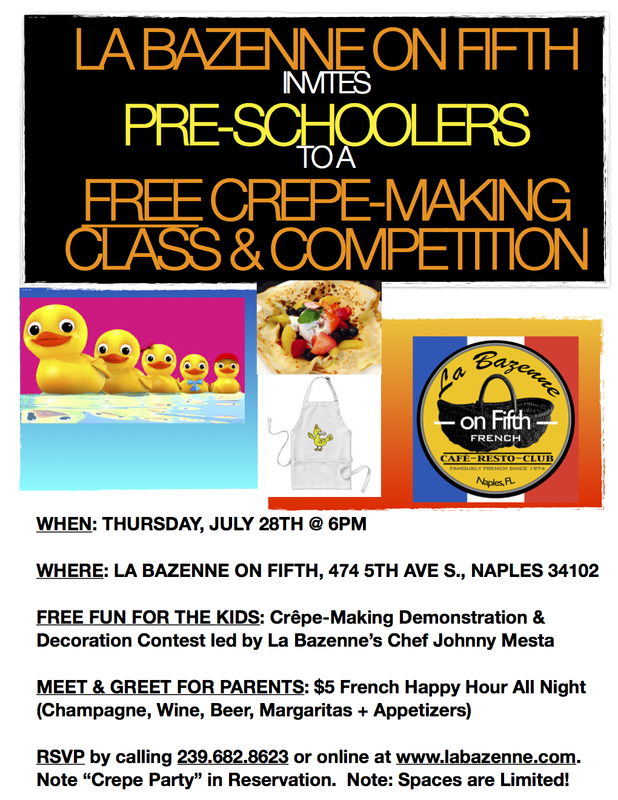 RSVP online at www.labazenne.com or by calling 239.682.8623. 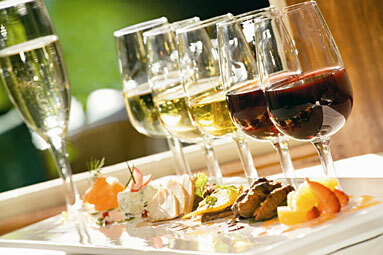 Each Wine Tasting will be accompanied by a Light Hors d'oeuvre inspired by a Menu Item that Pairs with Each Wine. 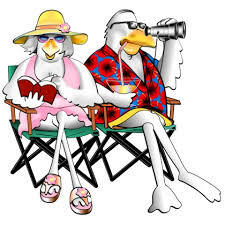 La Bazenne invites you to an Exclusive Hands-On Cooking Class and Dinner "Chicken - 4-Ways"
on Sunday, August 23rd from 5pm - 8pm. 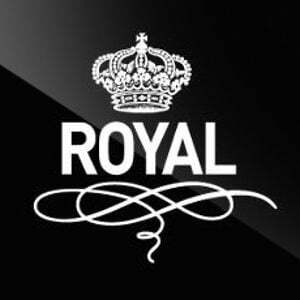 The cost of the event is $55 (inclusive of tax and gratuity)and includes a Complimentary Bazenne Royal - our Signature Champagne Cocktail! Our Team also will be at your service to accommodate any Additional Drink Purchases. Reservations can be made by calling 239.682.8623 or 239.529.8246. Seating is Limited and a Credit Card will be Required to Secure your Booking. The cost of the event is $30 (inclusive of tax and gratuity) and includes a Complimentary Glass of French Bubbly or Your Choice of Any Happy Hour Drink! Our Team also will be at your service to accommodate any Additional Drink Purchases and our $5 French Happy Hour (Drinks & Appetizers) will be exceptionally extended to 7pm so you and your friends can enjoy more of the Best of Modern French Cuisine in Naples! Our team will enchant you with a fun-filled Cooking Demonstration and Tasting of three different ways of preparing Mussels, 2 Classic and one More Innovative Recipe: Moules Marinières, Mouclade Charentaise and 'French-Mex' Mussels. The cost of the event is $30 (inclusive of tax and gratuity) and includes a Complimentary Glass of French Bubbly or French Sauvignon Blanc! and includes a Complimentary Glass of Bubbly! Our Team also will be at your service to accommodate any Additional Drink Purchases and our $5 French Happy Hour will be exceptionally extended to 7pm so you and your friends can enjoy more of theBest of Modern French Cuisine in Naples! No pre-payment is required, but RSVP Today as seating is limited! Reservations can be made online or by calling 239.682.8623. 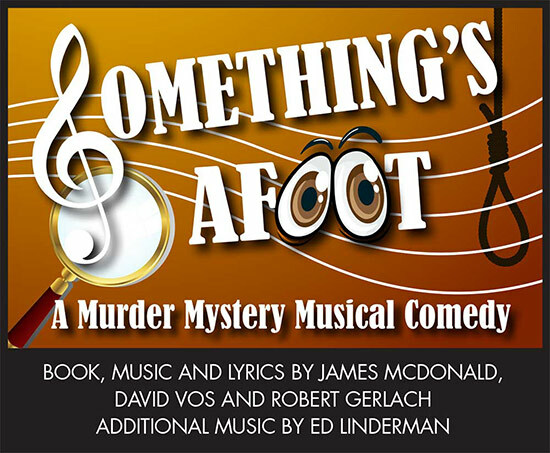 Shake up your Summer with a Fun-Filled Dinner and Theater Night on July 23rd! 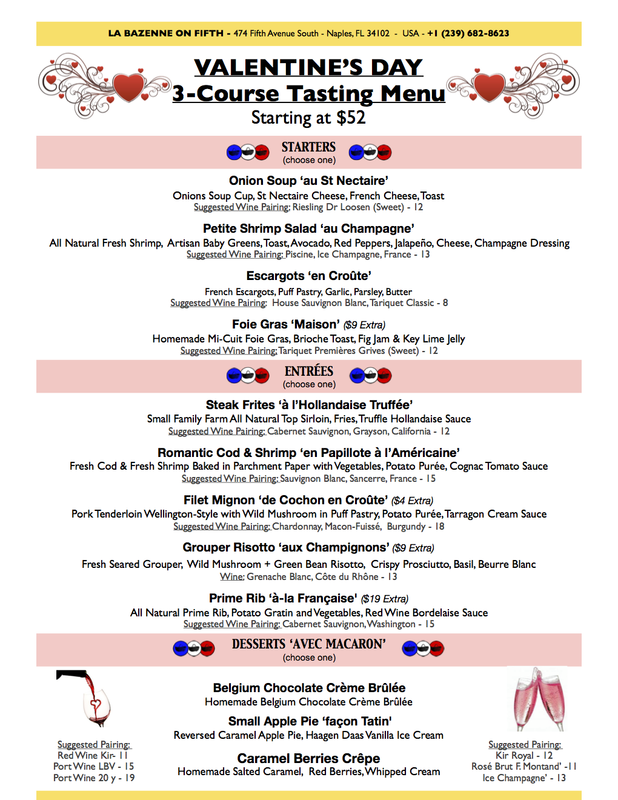 The full à la Carte Dinner Menu, as well as the Early Romantic Dinner Special (2 Entrées + a Bottle of Wine for $38 / couple) will be available. Mayor John Sorey, who is the Executive Director of the Naples Players, will also be in attendance to speak about the Naples Players and the Show. Seating is Limited, so please RSVP to Amy Giacometti on 239.529.8246 or Zen@labazenne.com to book your seats no later than July 20th. Kindly note that we have secured discounted group rates of $38 / person and this must be paid at the time of booking. No pre-payment for Dinner is required. Bastille Day "Soirée en Blanc Party"
Amis Adorateurs de la France! 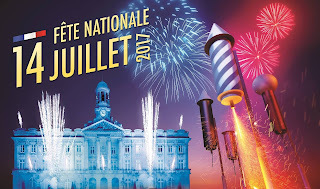 Let La Bazenne be your host this year for a "Soirée en Blanc" or "White Night" Cocktail Party for Bastille Day - France's National Day - on Tuesday July 14th starting at 6pm! The first 25 Attendees to RSVP and Dress in White for Dinner on July 14th will enjoy a Complimentary La Bazenne Royal Champagne Cocktail! Enjoy our $5 French Happy Hour Drinks and Appetizer Menu and / or 2 Entées and a Bottle of Wine for $38 All Night. This is an event you don't want to miss, so RSVP as soon as possible online or by calling 239.682.8623! Venez parler français or anglais! Bonne fête à tous! La Bazenne is the Best Place to Enjoy a Full Day of Fun-Filled Festivities on the 4th of July! on Saturday, July 4th starting at 9:30am. Seating is on a First Come-First Serve Basis. in Front of La Bazenne between 10am - 12pm. Baby Back Ribs, ZenBurgers and Croissant Dogs. 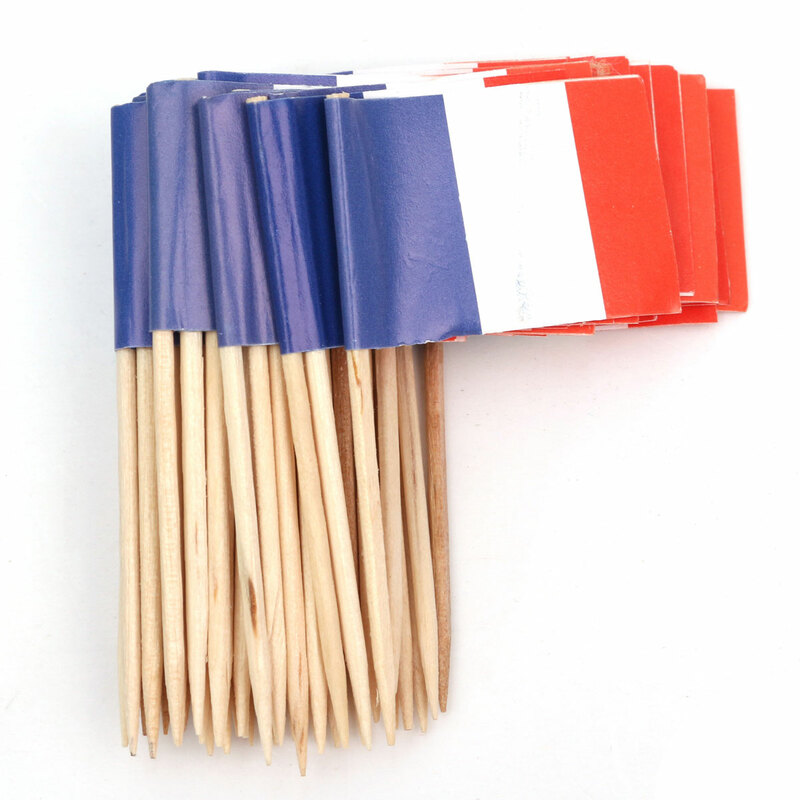 All New "French Lunch Affairs" To Go Boxes starting at $12. with $5 Drinks and $5 Appetizers. For the 9 pm Fireworks, Enjoy our Full Dinner and Café Menus from 5pm to Close before or after the Fireworks Show at 9pm. our collection of dry, French-style American Rosés as well as St. Tropez Chic Rosé will be 20% off all weekend long. 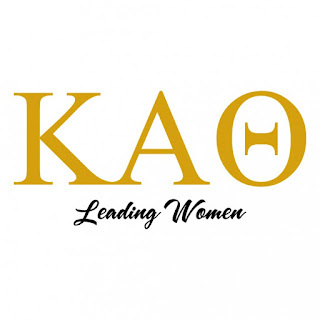 on Tuesday, June 30th from 12pm - 1pm! Meet New Friends and Associates or Bring Some of Your Own. This is a Great Networking Opportunity and a Chance to Discuss Issues Most Critical to You with a Registered Investment Advisor, David Forward, SVP at Westbourne Investments. Space is Limited so please RSVP as soon as possible to Maryann Forward on 239.692.8007. Please refer to the flyer below when registering to inform us of your menu preferences. We can also accommodate any and all dietary requirements, so please inform us of any special requests when registering. 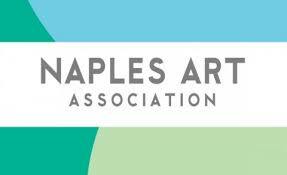 Arts Naples World Festival Feature Event! Pay tribute to all the women in our lives! Celebrate the culinary creations of the “Mères Lyonnaises,” mothers of French gastronomy. The Executive Chef will showcase and interact with participants in a hands-on creation of a collective wine dinner which all participants will then sit down and enjoy. Tweak your French culinary techniques using Florida ingredients to make perfect French-style small bites you will be proud to serve at your next cocktail party. Then, over lunch in this lively, upscale Bistro and Social Club, you’ll meet the American and French owners, Amy and “Romeo” Giacometti, a second generation restaurateur, and understand why this restaurant is so beloved by so many. Vibrantly-paired wines will accompany. 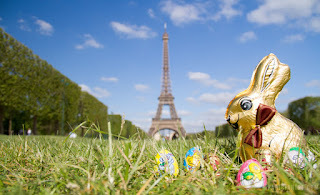 We very much look forward to welcoming your family and friends to a French-inspired Easter Weekend Celebration. Brunch Service will be offered from 9:30am - 3pm; and Dinner Service from 5pm - Close on both Saturday and Sunday. On Easter Sunday, our full à la carte Brunch and Dinner Menus will be on offer as well as a variety of exquisite specials, including a Duo of Lamb, Braised Rabbit and Fresh Maine Lobster. We will also offer an Extended Early Romantic Dinner Menu selection with the Easter Specials of the Day.As always, "Happy Sunday" = 2 for 1 Mimosas & Bazenne Royals All Day! This French Thursday, April 2nd, we will be offering a New Selection of Rosé Tasting Flights for you to enjoy. Rosés are a perfect pairing wine with many of our Signature Dishes and are delightful to enjoy by Day or Night on these beautiful Spring days in Naples. Flights of 3 half glasses start at $18 and go up in price according to your selection. Social Club Members will be invited to enjoy an additional tastingof their Choice for Free! This French Thursday, March 26th, La Bazenne on Fifth invites you to a Vermouth Tasting Evening. Social Club Members will be offered an additional tasting glass for Free! 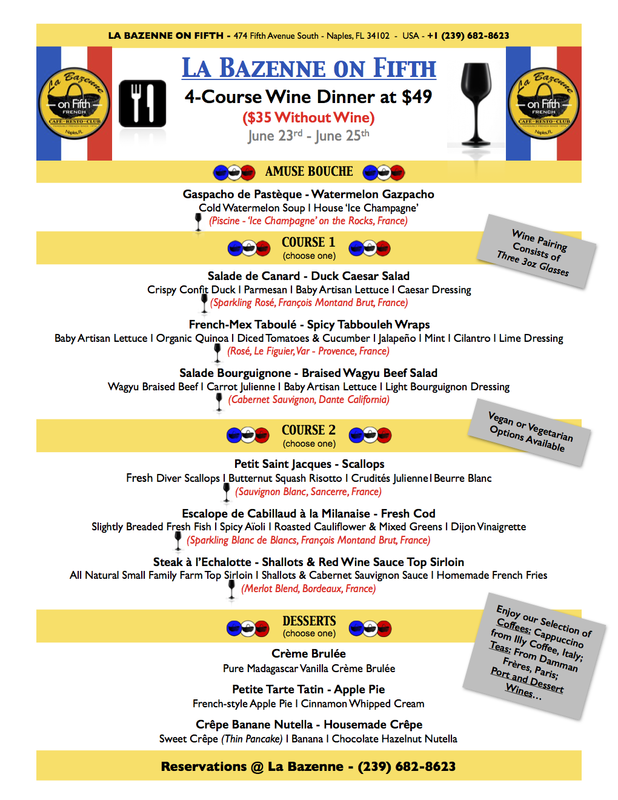 La Bazenne's New Wine Pairing Menu Has Arrived! At La Bazenne, we understand how complicated it can sometimes be to select the perfect wine with your meal, especially if you're in a larger party with so many different meal options. Every wine on our wine list at La Bazenne has been purposely selected to pair with our menu items and we would like to share our journey with you. Our new Dinner Menu now includes our recommendations of wines that pair perfectly with each food option. Almost half of our wine list is available by the glass so you can enjoy a different pairing throughout your dinner experience. we invite Social Club members to try one of our suggested pairing glasses for FREE with their Dinner selection. If you're not a Social Club Member yet, you're still welcome to try our pairings for yourself with your meal or create your own pairings that we welcome you to share with us! We invite you to attend and support Naples’ premier winter event — The 39th Annual St. Patrick’s Day Parade, to be held on Saturday, March 14th, 2015 in Downtown Naples. The St. Patrick's Day Parade is now the largest privately-funded Parade in the state. It draws over 40,000 people to downtown Naples each year to celebrate Irish heritage and Irish culture in America. Join us for Brunch / Lunch from 9:30am - 3pm or for Dinner from 5pm to Close for a fun-filled meal with the best view of the Parade on 5th Ave South! This French Thursday, we will be making some additional French-inspired concoctions that we look forward to tasting with you. La Bazenne Social Club Members are invited to enjoy FREE SAMPLING GLASSES of these new cocktails. Be the first to taste and make your mark on our new Cocktail List! Join us for "French Thursday"to celebrate a slice of French culture and cuisine in Naples. 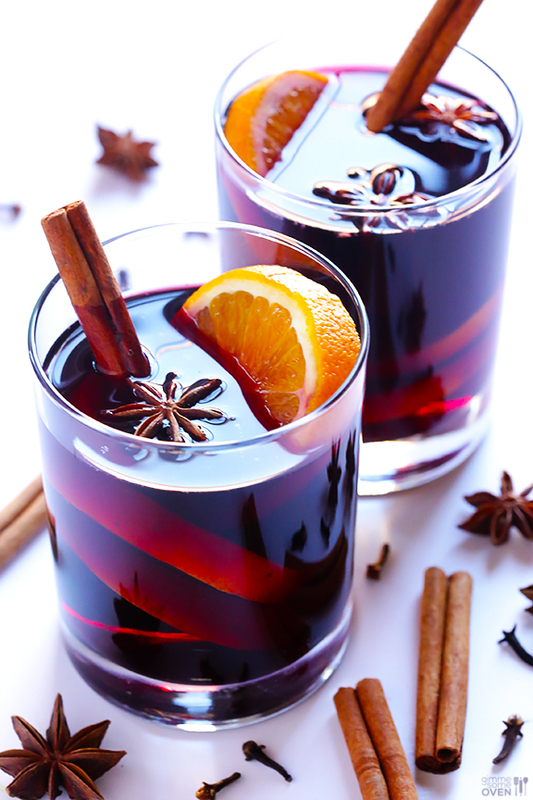 As temperatures are dropping again, this week's theme is a Winter Vacation-inspired "Vin Chaud" (Hot Mulled Wine) and Crêpe Sampling Platter at the ZenBar from 5pm Onwards. Mardi Gras Evening on 5th will feature an array of live musical performances throughout the sidewalk areas of 5th Avenue South from 6:30pm - 9:30pm. Our Team at La Bazenne welcomes you to join us in or out of Costume for the best of Modern French Cuisine - just as you would expect in New Orleans! If you can’t sweep your loved one off to Paris this year, book your dinner or lunch with us and enjoy a taste and feel of the most romantic city in the World. You are welcome to select from either our à la carte Menu or a romantically-themed Tasting Menu with Recommended Wine Pairings. Don’t forget, 5th Avenue South and the Ferrari Club of America will be hosting the Annual “Cars on 5th” Show from 10am - 3pm, so reservations are recommended for either our Brunch / Lunch (9:30am - 3pm) or our Dinner (5pm - Close) Services that day. We will be hosting a Chocolate and Wine Pairing Event at the ZenBar. We invite you to sample our Signature "Bouchon Décadent" Dessert with a Red Wine Kir for $18. Enjoy the Finest of Wine and Cheese Pairing at La Bazenne This Thursday! This "French Thursday", January 22nd, starting at 5pm, we are flying in a premium selection of new cheeses for you to enjoy with perfectly paired wines from our newly expanded wine list! from either our standard or premium cheese lists. 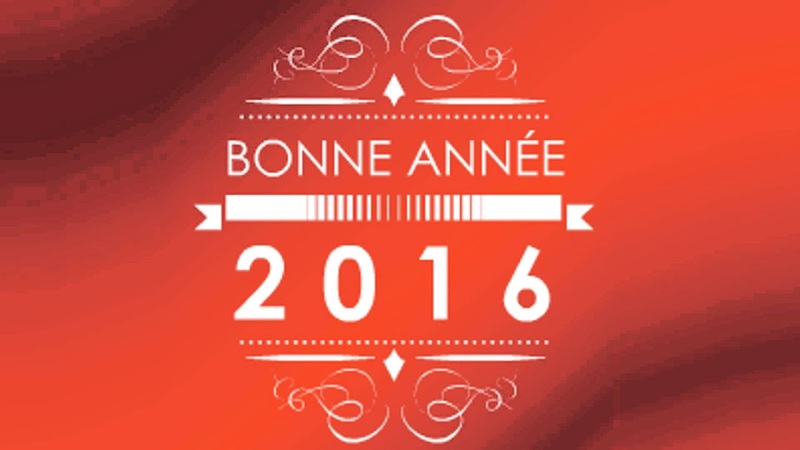 This "French Thursday" (January 29th), La Bazenne welcomes you to our Chandeleur Party! Before you put away your ski gear, head over to La Bazenne on Fifth for an "Après Ski"-inpired Crêpe and Mulled Wine Afternoon. From 4pm - 5pm, we will be hosting a Crêpe-Making Contest during which we welcome you to design your own Crêpe using a large buffet of ingredients supplied by our Kitchen (e.g., Chocolate, Salted Caramel, Nutella, Whipped Cream, Fresh Fruit, Jam / Jellies, and More!). 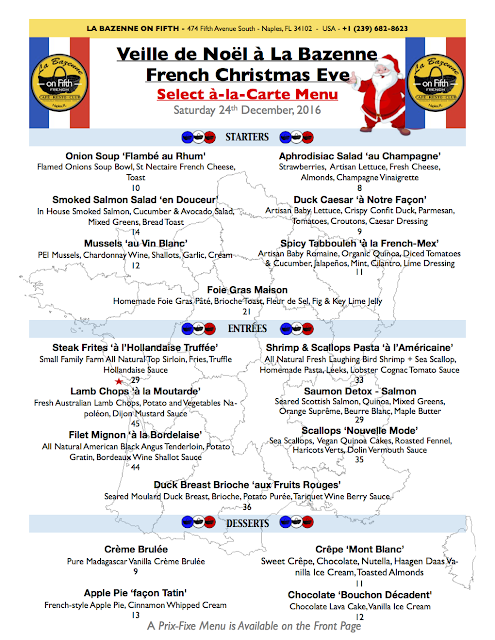 We will also be serving Vin Chaud (French-style Warm Mulled Wine). Our Kitchen Team will make the actual Crêpes, so all your have to do is decorate your Crêpe with the Toppings provided (or any special ingredients you would like to bring from your own Kitchen!). The Best Crêpe in terms of Flavors and Style will be featured at our Restaurant for the Upcoming Week of La Chandeleur and the Designer will be entitled to enjoy his personalized Crêpe for Free throughout the Week. (Limit one per visit. )Adults and Children Alike are Welcome to Participate! The cost is just $8 per Participant, or $5 for La Bazenne Social Club Members. The Catholic holiday of Candlemas, on 2 February, is a feast to commemorate the purification of the Virgin Mary and the presentation of baby Jesus. In France, this holiday is called la Chandeleur, Fête de la Lumière,* or jour des crêpes. 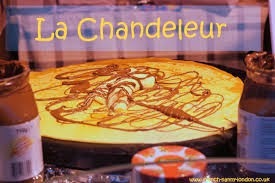 Not only do the French eat a lot of crêpes on Chandeleur, but they also do a bit of fortune telling while making them. It is traditional to hold a coin in your writing hand and a crêpe pan in the other, and flip the crêpe into the air. If you manage to catch the crêpe in the pan, your family will be prosperous for the rest of the year. This Thursday, January 15th, in honor of the "Jet-Set" and the Full Time Locals who welcome them back each year, La Bazenne is celebrating our Weekly "French Thursday" Happy Hour from 5pm - Close at the ZenBar with Champagne Flight Night! We will be offering flights of our popular Kir Royal Selection (Cassis, Raspberry, Peach, Pink Grapefruit, Violet, Sorel) with any of our French Champagnes sold by the glass. Flights of 4 half glasses start at $20 and go up in price depending on the level of champagne selected. As always, our French selection of Cheeses or "Petits Bites" (Half Price-Half Size Dinner Entrées) will be on offer to pair with your personalized Champagne Flight. Even if you're not a a champagne lover, you're still most welcome to join our "French Thursday" Happy Hour and take advantage of our wide selection of 2-for-1 House Wines, Tap Beers and Champagne / Wine - Based Cocktails from 5pm to Close! This Thursday, January 8th, we will be celebrating the tradition of the Feast of Epiphany at the ZenBar with a "Galette des Rois" Party, starting at 5:30pm. 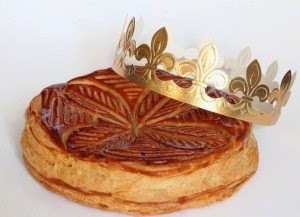 The Galette des Rois or “Kings’ cake” is a pie-like treat that is essential to the celebration of Epiphany. In each Galette des Rois a small figurine, or fêve, is baked in. Whoever receives this figurine in their slice is “king for the day” and gets to wear a paper crown, a tradition enjoyed by adults and children alike. Everyone who joins us for French Thursday on January 8th will be invited to share a complementary piece this year's Galette des Rois and join in the game. Seating is limited so please reserve your place today by calling 239.682.8623 or booking online at www.labazenne.com. 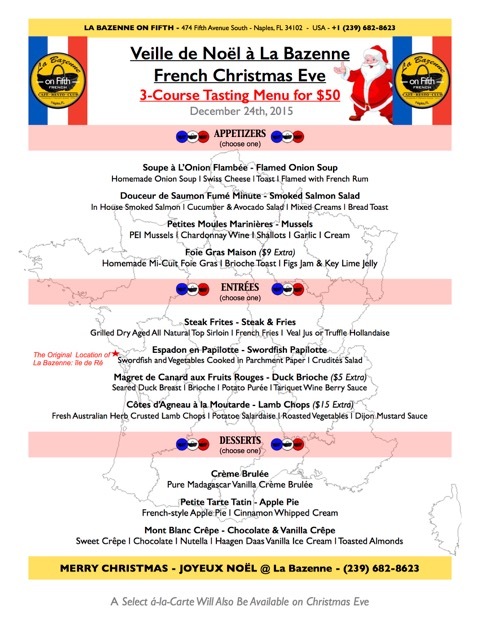 Please mention "French Thursday" when making your booking. The ZenBar is the perfect place to start or finish your evening as every night we host Happy Hour from 5pm to Close with a decadent list of 2-for-1 Drinks. There is also an extensive Bar Menu, including "Petites Bites" (half portions of Dinner menu items at half the price) as well as our full selection of sweet and savory crêpes. On Friday, May 23rd, La Bazenne on Fifth will be celebrating the official LAUNCH of our ZenBar with the introduction of our Afternoon and Late Night Crêpes and Tapas Menus! This Friday, from 4:00pm - 6:00pm, we invite you to sample our new Afternoon Crêpes & Tapas Menu as well as our House Wines, Beers on Tap, and Wine / Champagne-based Cocktails, all at HALF PRICE. Then, from 9:30 - 12:00pm, we will be introducing our Late Night Crêpes & Tapas Menu so that you can enjoy your favorite sweet / savory crêpes or French Tapas all through the evening, again all at HALF PRICE for this special Launch Night. On Sunday, May 25th, La Bazenne on Fifth will be closing our dinner service in order to host our second cooking course, French Classics. This interactive course will be held in our main dining area and kitchen from 5:00pm - 8:00pm, during which our Executive Chef Andy Hyde will showcase and lead participants in utilizing some unique techniques to bring their culinary skills to the next level. 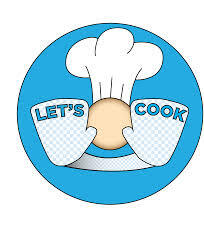 At the end of the course, all participants will also be offered a special dinner prepared by our kitchen staff utilizing the ingredients prepared by participants. The cost of the course is $69 / person for non-Social Club Members and $60 / person for Social Club members. Our ZenBar will also be open throughout the events to provide you with our wide selection of cocktails, wines and beers at the prices listed on our Drinks Menu. Seatings are limited and reservations will be taken on a first come basis and can be made by calling 239.682.8623 or by emailing AG@labazenne.com. On Thursdays (beginning Thursday, May 29th) from 12:00 - 2:00pm, La Bazenne on Fifth, in partnership with the Alliance Française de Naples (AFN), will be hosting a weekly “Causerie" (French-Speaking Table) with AFN President Madame Jenkins. Anyone with an interest in speaking or learning the French language is welcome at no additional charge! 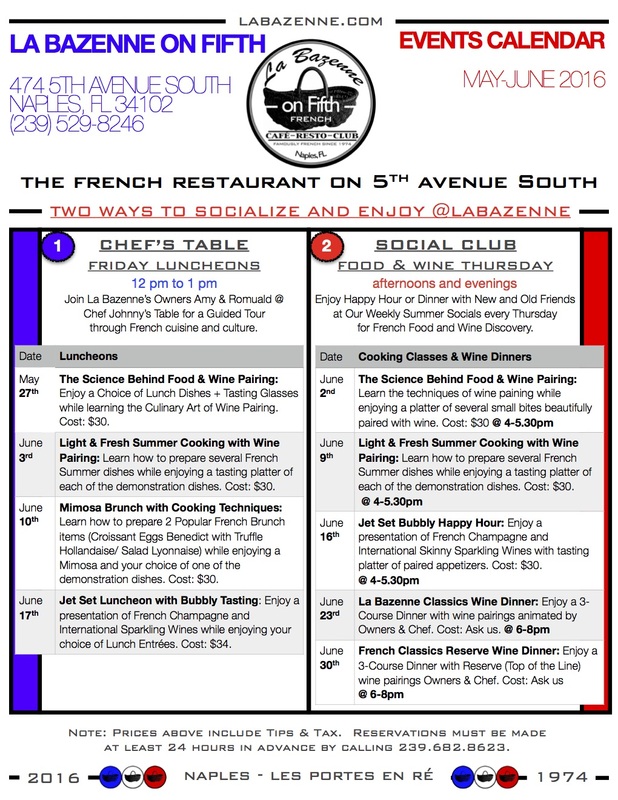 RSVP by calling 239.682.8623 or booking a seat on www.labazenne.com. In celebration of D-Day, La Bazenne on Fifth is offering veterans and active duty military 20% off of any food items on our Menus this Friday and Saturday, June 6th & 7th! For this special day, we will be offering several additional French classics from Normandy, including Escalope de Veau à la Normande, Tarte au Camembert, et La Crêpe Normande Flambée. As a special tribute to the men in our lives, La Bazenne on Fifth will be hosting a special Father’s Day brunch and dinner service on Sunday, June 15th to honor all of the Men in our lives! We’ve been saving some of our most decadent menu items for this special day and look forward to celebrating with you! Watch the FIFA 2014 World Cup at La Bazenne on Fifth! Come join us at the ZenBar at La Bazenne on Fifth through July 13th to cheer on your favorite teams battle it out in the FIFA 2014 World Cup! We'll be playing all the games all day on our new projector theatre at the Bar and hope you'll join us to taste our new Summer Menu items and Signature Drink Pairings! In celebration of the 40th Birthday of La Bazenne, La Bazenne on Fifth will be hosting a joint celebration with the original La Bazenne in Île de Ré, France on Saturday, June 28th! 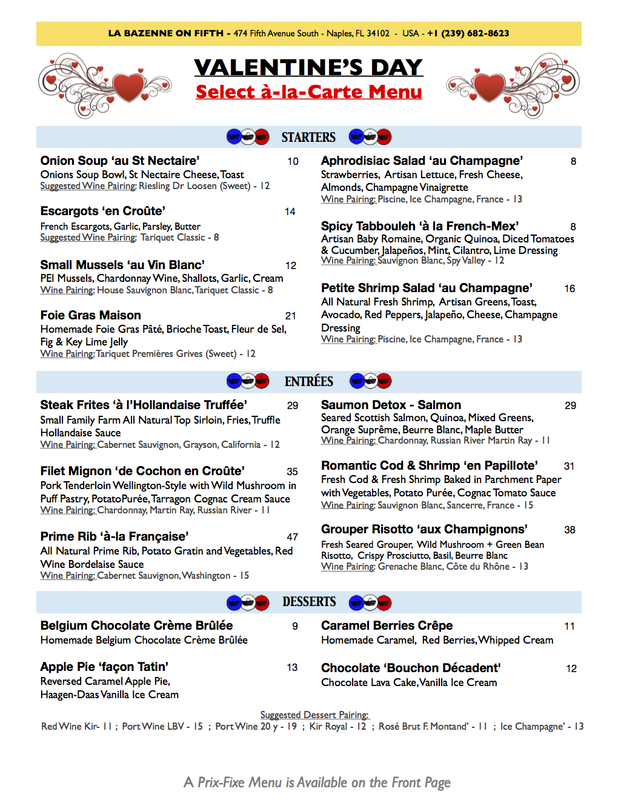 On this special day, La Bazenne on Fifth will be offering its "$29 Early Romantic Dinner" Prix-Fixe Menu all evening, from 4pm onward, with an additional La Bazenne Royale signature champagne cocktail on the House! For those who have not yet tasted our Summer "Early Romantic Dinner", you are in for a real treat. It is a truly gourmet 3-course menu with Choice and we look forward to sharing it with you! Celebrate 4th of July Brunch in Style at La Bazenne on Fifth! Come for the Parade and stay for the Fireworks! Enjoy the tastiest bites on 5th, premium Illy coffee, decadent champagne cocktails and the best views of the day’s events! 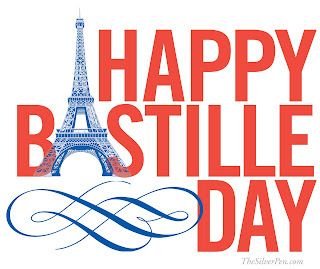 La Bazenne on Fifth, in partnership with the Alliance Française de Naples, will be hosting a private event on Sunday, July 13th from 5:30pm - 10:00pm to celebrate Bastille Day! 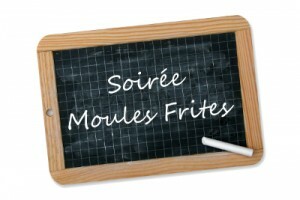 The evening will commence with a Cocktail Party (Cash Bar) from 5:30pm - 6:30pm, followed by a progressive dinner, featuring La Bazenne’s Signature French Classics. To help us ensure an exceptional dining experience, we ask that you RSVP NO LATER THAN July 10th with the names of your Guests as well as well as your meal preferences. Reservations can be made by calling 239.682.8623 or emailing AG@labazenne.com. Sign-up forms will also be available at La Bazenne on Fifth. On Sunday, July 20th, La Bazenne on Fifth will be hosting our next cooking course on Seafood Aphrodisiacs! 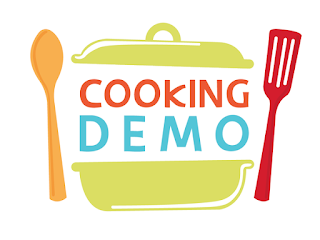 This interactive course will be held in our main dining area and kitchen from 5:00pm - 8:00pm, during which our Executive Chef Andy Hyde will showcase and lead participants in utilizing some unique techniques to bring their culinary skills to the next level. At the end of the course, all participants will also be offered a special dinner utilizing the ingredients they prepared. Seatings are limited and reservations will be taken on a first come basis. Bookings can be made by calling 239.682.8623 or by emailing AG@labazenne.com. During this 1.5 hour course, Executive Chef Andy Hyde will demonstrate how to host a classy cocktail party à la française! 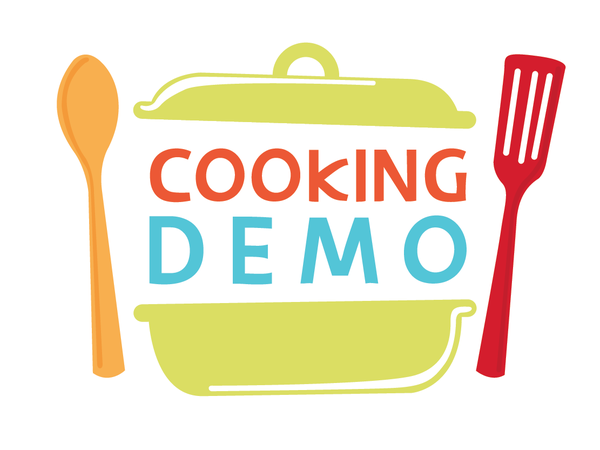 Participants will learn the recipes and techniques for several different Gourmet French Tapas that can easily be replicated in their home kitchens. Cost: $30 / person, which includes the 1.5 hour class, tastings of all Gourmet French Tapas taught in the course, plus a glass of wine! On Friday, October 31st, La Bazenne on Fifth is hosting a Halloween Crêpe Making Contest! Come anytime after 4:30pm to participate. Rewards will be offered to those with the best crêpes in each age category. On Saturday, November 15th, La Bazenne on Fifth is participating in the Naples Grape Escape. This is a true festival of fine food, exquisite wines and outstanding artisan beers. The main event, held on Saturday evening, is a full six blocks of entertainment, food, wine and craft beers all along Naples' famous Fifth Avenue South. That night, Fifth Avenue South is closed to all vehicles and the whole street turns into a huge party zone! 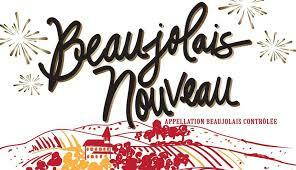 La Bazenne on Fifth is receiving the first stock of Beaujolais Nouveau Thursday, November 20th! Complimentary Tasting Glass of Beaujolais Nouveau! Make your reservation today by calling 239.682.8623 or booking online at www.labazenne.com. Please mention in your reservation that you will be joining the French-Speaking Table! Even if you're not joining our Weekly French-Speaking Table, You are Still Most Welcome to Dine with us and sample the new harvest of Beaujolais Nouveau for $8 / glass or $30 / bottle! Join us for Happy Hour from 5pm - 7pm every day for 2-for-1 Drinks and our New Bar Menu! 5th Avenue South will host the Annual Christmas Walk and Tree Lighting Ceremony on Thursday, December 4th from 5pm - 8:30pm. This Naples holiday tradition will commence with holiday performances, the lighting of the majestic Christmas tree by the mayor, and a visit from Santa himself! 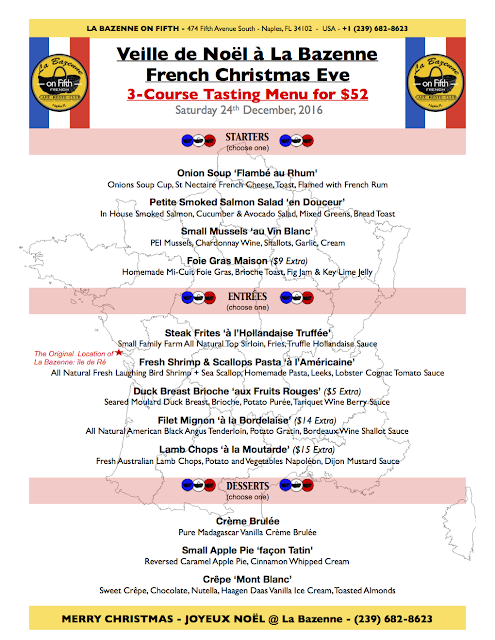 La Bazenne on Fifth will be hosting its own Tree Lighting Ceremony and we welcome you to join us in decorating our Tree while enjoying our New Seasonal Menu and Expanded Wine List!! La Bazenne on Fifth is the best place to watch the Naples Annual Christmas Parade. 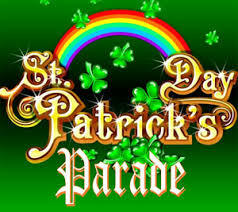 Tables are Booking Quickly, so Please Call Us or Book Online Today at www.labazenne.com for a Prime View of the Parade! La Bazenne on Fifth will be hosting a Joint French Christmas Celebration with the Alliance Francaise de Naples. If you are interested in joining, please logon to www.afnaples.org for more details! On Wednesday, December 31st, La Bazenne on Fifth will be hosting a Very Special New Years Eve Dinner - "A Journey through France" - from 6:30pm - 11:00pm, followed by a Champagne Toast at 12:00am. 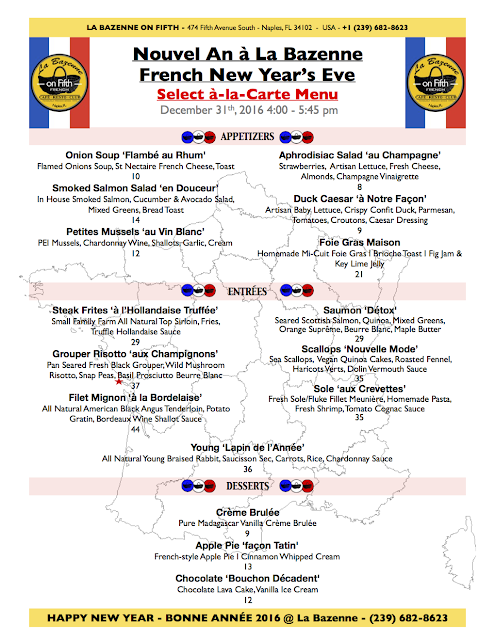 This year's New Year's Eve Dinner will consist of an elegantly innovative 3-Course Meal inspired by the regions of France. 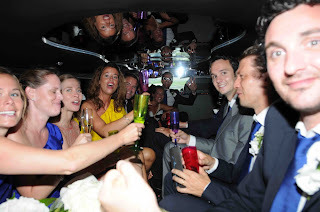 All guests will also receive a complimentary Glass of Champagne. à la carte Dinner Menu from 5:00pm - 5:45pm. from 7:30pm to 8:00pm and 5th Avenue South is a perfect place to watch the action! Tables are booking quickly, so be sure to RSVP TODAY by calling 239.682.8623 or booking online at www.labazenne.com.